Placement of USB devices can be difficult, especially when longer runs are required, because normal USB specifications limit connections to a maximum run of only 16ft. 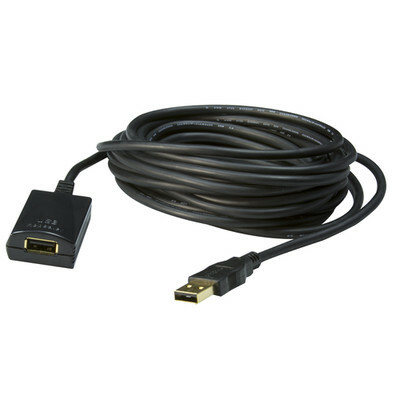 This high-speed USB 2.0 extender cable eliminates the USB length constraints and allows for extended USB connections. You can combine up to four of our 16ft. cables for a maximum length of 64ft. Worked as intended. I used this cable to place my computer on the other side of the wall which allowed me to operate a wired mouse and keyboard on the monitor side. I ran this cable into the wall and attic for a clean install. I'm happy with the results. Very good quality and price. I am very pleased with this purchase, particularly when considering that office supply stores sell these for almost three times the money. Product looks like quality--will complete my test this week. I did not receive the product that was pictured on the website. I was sent a generic, no name replacement. So far, the cable appears to be working as it should. The 16 foot active repeater is connected from my laptop to a high speed, powered USB hub and I am detecting no slow down in communication speed or loss of performance of the devices connected to the hub. I was skeptical that I'd be able to use a webcam over a 16' USB extension. So far, the cable length has been no issue at all. Excellent if you get this one that is blue. Most of the time you will not get a USB device to work past 2-3 of these stacked together. The extension cable worked just as I had expected !!! fully functional. very happy with the product. Performed just as it was promised. Very pleased! The perfect cable for extended requirements. Signal is clear. Havent used the product yet, but cannot beat the prices! I ordered two of the USB 2.0 extension repeater cables. The overall quality of the cables were good, the female end of the cable was not as sturdy as I would have liked it to be but it did the job. The product description states that you can connect up to four of these cables together to get a length of 60 feet. These cables work fine if you are only using one cable. When I tried to use two cables, my XBOX 360 wireless network adapter would not connect to my wireless network. I would get a blinking green light instead of a solid green light. When I went back to just one cable the wireless adapter connected just fine. The bottom line here is, if you need more than sixteen feet of extension, this product will not work if you connect more than one cable. Worked perfectly. No detectable slowdown in speed, compared to a single standard 6-foot usb cable. Great product at an excellent price.